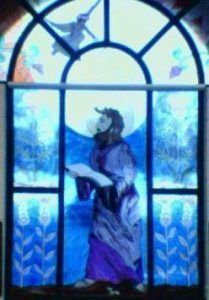 St. Matthew, one of the twelve Apostles, is the author of the first Gospel. This has been the constant tradition of the Church and is confirmed by the Gospel itself. He was the son of Alpheus and was called to be an Apostle while sitting in the tax collectors place at Capernaum. Before his conversion he was a publican, i.e., a tax collector by profession.